Many investors like real estate because of the potential for steady, above-average returns with only a limited downside risk. Others, however, are more intrigued by the possibility of a quick strike in a real-estate boom, holding a property for a short time as values rise and magnifying their return with leverage from a mortgage or other low-cost loan. Boom markets don’t come along very often in real estate. There haven’t been any since the big crash of 2008, and before that, they were usually limited to one or two places at a time, like Houston in the mid-1980s, New York later that decade or Southern California in the early 1990s. But booms are back, with some already well under way and a good number in the early stages. Home building lagged almost everywhere in the last decade while strong economic growth has pumped up demand for housing in many local markets, creating the imbalance that drives a boom. The 25 markets listed below are mainly in the early stages of a boom, even though home prices have already been rising at a brisk pace. Denver is the exception, with prices already into boom territory. At Local Market Monitor, we identify potential boom markets by calculating how much the current average home price is above the local “income price.” When that margin is greater than 15%, a boom is possible. You can see that our calculations range from 16% for Asheville and Sacramento to 47% for Denver. This is a metric we have been monitoring for over 25 years, and it has proved to be extremely reliable at identifying booms and busts in advance. The importance of identifying a boom market is that home prices in a boom take on a life of their own, increasing at a high rate for several years, with jumps of 10-15% a year quite likely. Obviously, if you invest at the early stage of a boom, you can expect a big increase in value in just a few years. The markets in our list have three characteristics that support a run-up in prices during the next few years. They’re already over-priced compared with the income price (no longer “recovering”). The average home price increased at least 8% last year. And with the exception of West Palm Beach, the local economy has been strong, in many cases adding jobs well above the 1.6% national rate. What kind of investment can you make in these markets? It’s got to be one you can quickly exit in a few years. Single-family is always easiest, and if you’ll be renting out, stick with short leases. Rehab for immediate resale is a good strategy, maybe staging several properties at once. Apartment buildings or existing rentals are lesser choices because they probably won’t have the same appreciation. 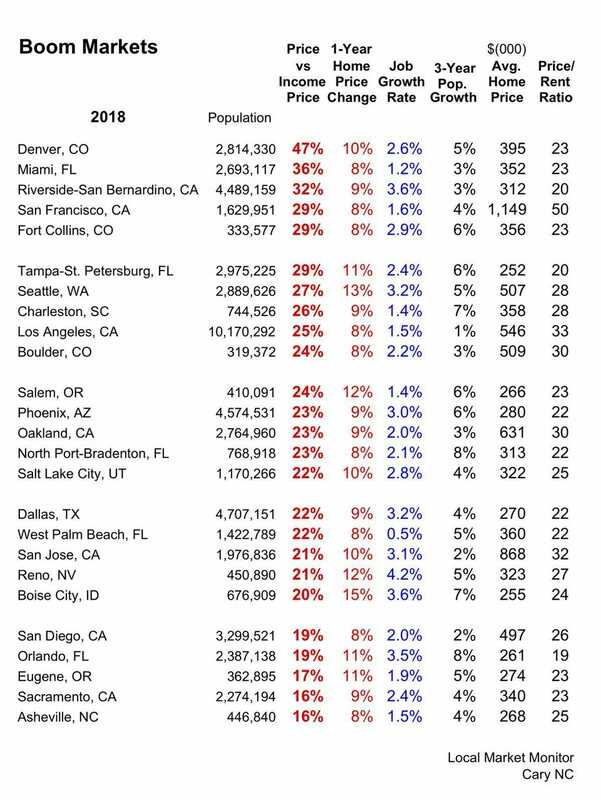 Note that the Price/Rent ratio is well above 20 in most of these markets, which means that fewer renters are able to pay what you would normally want. You’re really just renting the property for extra return, not the main reward, so don’t hold out for top rental dollar because you may not get it. Now let’s talk about risk. We identify boom markets for their investment potential but also to identify where the risk of investing is higher than normal. Boom markets are risky markets. The more home prices move above the income price, the riskier a market gets. Denver is already a riskier market than Asheville. In the boom that preceded the 2008 crash, prices in some markets were more than 60% higher than the income price — and subsequently fell by that amount and more. You don’t want to be holding a property past the peak of a boom. Local Market Monitor also forecasts home prices. We forecast that prices will rise briskly in all 25 of these markets over the next three years. But the risk for investors increases in boom markets along with the prices. What can end a boom? In Houston back in the 1980s, it was a drop in oil prices. In 2008, it was sub-prime mortgages. These days it could be a trade war, an economic crisis, a political crisis, a real war. How to protect yourself: If home price increases drop off — from 9% a year to 5%, let’s say — sell. If you wait for the peak, you’ll find few buyers, maybe none. And maybe you shouldn’t even wait that long — it takes time to sell a property. Maybe just set a reasonable appreciation goal and sell when the market hits that.